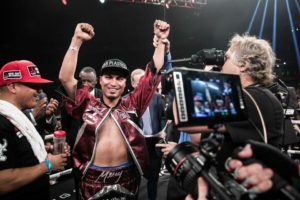 Mikey Garcia made history Saturday night by becoming just the third fighter in boxing history to win world titles from featherweight through Jr. welterweight becoming a four division champion with a unanimous decision win over Sergey Lipinets ( 13-1, 10 KOs) in a very competitive good fight between two undefeated world champions. Garica (38-0, 30 KOs) showed tremendous toughness, good whiskers, and good accurate punching as he was in very tough tonight in San Antonio, Texas against a young, strong, and very hungry determined world champion in Sergey Lipinets. The 30-year-old Garcia started the fight very well using his precision and accurate punching from a distance to catch Lipinets with the cleaner more effective shots. Lipinets was not discouraged and was never broken by Mikey as the Kazakhstan fighter showed many wrinkles in his game throughout the contest. Lipinets showed a very accurate jab that would bloody the nose of Mikey Garcia early in the fight. The 28-year-old began to gain momentum in the middle rounds as he was constantly backing Garcia up and landing very good power punches that would get the attention of Mikey Garcia. Garcia however, stayed composed and showed a very strong chin as he was getting tagged with some big shots from Lipinets in many of the rounds. In round 7, Garcia would have the biggest moment in the fight by dropping Lipinets with a counter left hook and halting some of the momentum Lipinets was gaining in the middle rounds of the bout. Garcia displayed more punching power in this fight compared to his debut at the weight class against Adrein Broner. Garcia’s accurate counter shots definitely got the attention of Lipinets as the two warriors traded big shots in the championship rounds with both fighters closing the fight very strong in the 12th stanza. Many of the rounds were competitive but it was Garcia that was awarded a comfortable unanimous decision win. Mikey will now move on to bigger and better things as he will have many options to take for his next fight whether it’s returning lightweight division to defend his title or continue to campaign in the super lightweight division. On the undercard, Kiryl Relikh (22-2, 19 KOs) avenged his defeat to Rances Barthlemy (26-1, 13 KOs) last May with a clear unanimous decision win and winning the vacant WBA Jr. Welterweight strap. Relikh would not be denied as he simply outpunched and outworked Barthelmy throughout the bout as the 31-year-old Cuban was unable to match the pace of Relikh. Relikh becomes just the third fighter from Belarus to win a world title.